We have Ikea's Expedit TV storage unit, and I love the display possibilities it affords. 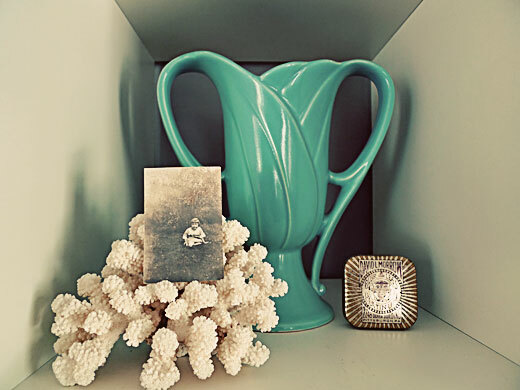 I love little groupings of items on display, groupings I call vignettes. Here are a few of my favorite vignettes from it's many cubes. 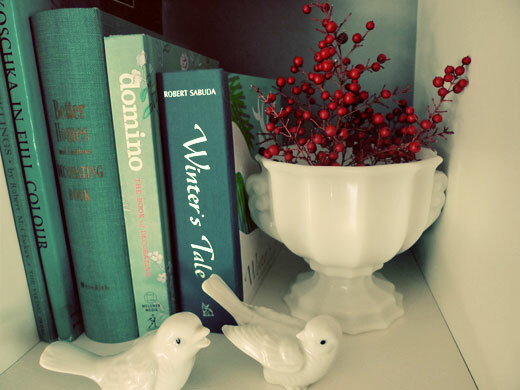 In this one I have some aqua books, a milkglass planter with red berries from Annie's yard, and two little bird friends (found at an estate sale). Here we have more books, this time in shades of white. 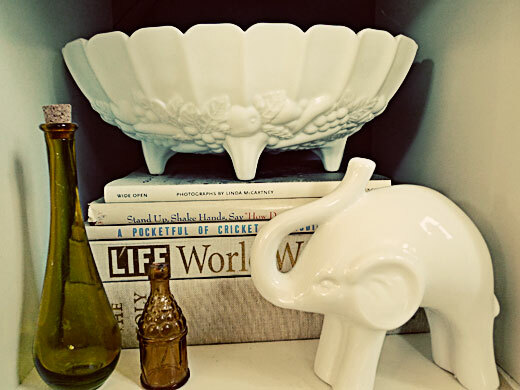 The footed milkglass bowl is from a dusty antique store basement (only $4! ), the ceramic elephant from Ross, and the gold bottles from Cory (who knows where he got them from). This one holds a marvelous vase, given to me by my parents. The tin used to hold pen nibs or tobacco or something. The coral is from a little store near here called Dixie Gem, a place of wondrous rocks and geodes and usually cool vintage jewelry (warning: interaction with the owners is a unique experience). Do you think it is weird to have old pictures of people you don't know? I don't, I think it is just fascinating. I don't know if these vignettes are interesting to other people or not, but my days are a bit full right now and I have the pictures already, so this is what you are going to see for the next few posts. Wow, I do the same thing! I have two stacked shelves just like these and all the books and objects are organized by color so that red things sit in a cell between the red books and the orange books, etc. The white things hang out with Bach's head on the piano. I'll send you some pics. Thanks, guys! Tim, I'd love to see yours. Do you re-arrange them often? About once a year or so, I get bored with them and switch them up.